Each passing day sees an expansion of the corpus of articles on doctrine and publications which, from a legal standpoint, examine the new reality prompted by the digital revolution. 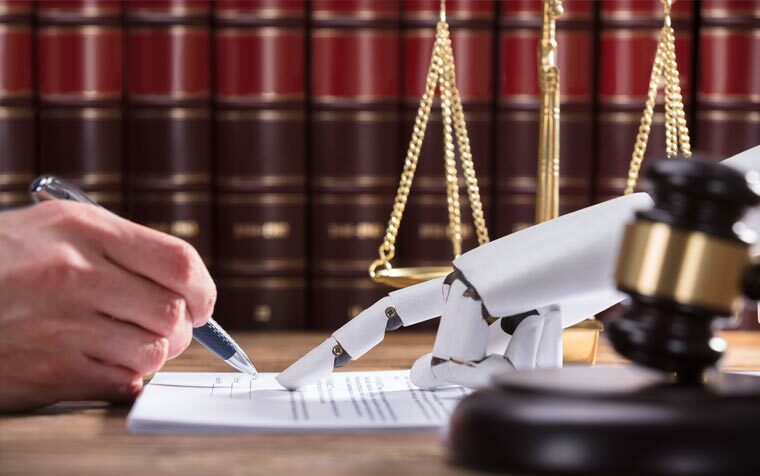 On the one hand, the introduction of robots in a whole raft of activities and, on the other hand, the development of artificial intelligence, have meant that a considerable segment of legal doctrine is starting to advocate and call for the advancement of a new branch of law. The creation of a new legal discipline called “Derecho de los Robots” (Robot Law) is the goal discussed in a book bearing the same title that was recently brought out by the publishing house, La Ley, Wolters Kluwer, and was edited by the expert specialising in this subject, Moisés Barrio Andrés, Council of State Lawyer and Doctor of Law. The book offers a multidisciplinary study that delves into the key issues concerning robotics and artificial intelligence and touches on the most significant scientific, legal, medical and ethical aspects. The publication’s multidisciplinary approach is achieved thanks to the variety and specialist credentials of the authors who are brought together under its umbrella. Prestigious professionals contribute to the book who have backgrounds in the legal profession, professional prosecution, physiotherapy, medicine, electronic engineering, the notarial profession, the labour inspectorate and tax inspection. Over the 10 chapters of which it consists, each of the different contributors sets out the core issues to take away from the already-begun deployment of robots in contemporary society and highlights the need to take stock, from a legal and multidisciplinary standpoint, of the psychological, social, ethical and legal significance of the introduction and development of robot technology. Chapter I.- WHAT IS A ROBOT? The first chapter begins by analysing the historical evolution, definition and classification of robots, as well as approaching the ethical problem entailed by using such technology. In this regard, Asimov’s three laws of robotics are mentioned, as well as the fourth or “zeroth” law of robotics: “A robot may not injure humanity, or, through inaction, allow humanity to come to harm”. In the second, the publication’s editor places the focus on the essential contention that is intended to be developed. The fourth industrial revolution is based on two vectors: on the one hand, artificial intelligence systems, and on the other, robots. As a result, the legal system should admit regulations under law to govern products and services that avail themselves of robotic systems, including artificial intelligence. Whatever the case, it is made clear that any such regulation upheld by law should be consistent with the values that characterise the Spanish legal system and therefore respect the free development of human personality and the fundamental rights of citizens. On the basis of Internet Law or Cyber-law already in place, the author takes the view that, with the birth of robotics, maturing Robot Law as an area is feasible. According to the author, a robot strictu sensu should be any “mechanical object that takes in its surroundings, processes what it perceives, and in turn acts positively with regard to the world”. The «sense-think-act» paradigm ought to be that which confers a legitimate place for robots relative to other technologies. He then goes on to describe three exclusive or transformative properties as essential characteristics of robotics (quoting Ryan Calo): their corporeality (the robot possesses corporeal materiality), unpredictability (the robot thinks and decides with a degree of autonomy) and their social impact (robots have a social impact or value for people and can come to have a substitution effect in relation to animals or even people). In this regard, we are already witnessing a debate within the European Union on the possibility of admitting a new legal agent via recognition of “electronic personality” for those robots that are capable of taking intelligent decisions autonomously. He concludes his study by advocating the creation of an autonomous discipline to deal with robots and which is warranted, on the one hand, by the fact that the various different applications studied belong to a single segment of technological research and innovation (i.e. robotics), and secondly by having socio-economic significance, as robotics represents an expanding and strategic market that has a substantial social impact, the growth of which needs to be controlled by means of regulatory intervention. The new Robot Law discipline will foster a new framework of clear and definite legal rules, as well as guarantee advanced regulation that allows robotics to develop, while adhering to the values that are characteristic of the European legal system and fully respecting the fundamental rights enshrined in the Charter of Fundamental Rights of the European Union. The author ends this chapter by stating that there is an urgent need to establish Robot Law and that this new legal branch should have a twofold object. The first would be “how to distribute the rights and responsibilities that stem from the actions of non-human beings”. The second (which is linked to the first) refers to “the social impact as regards the aspect of replacing human beings with robots and artificial intelligence systems”. The third chapter describes the background and most recent proposals for the legal regulation of robots. Along these lines, it analyses the European Parliament Resolution of 16 February 2017 with recommendations to the Commission on Civil Law Rules on Robotics (2015/2013(INL)), as well as the Opinion of the European Economic and Social Committee on Artificial Intelligence: the consequences of artificial intelligence on the (digital) single market, production, consumption, employment and society, of 31 May and 1 June 2017. The fourth chapter studies the extracontractual civil liability of robots, where the author makes the point that in some cases it will be a better idea to establish systems of objective liability and in other cases risk management systems, with a requirement to take out mandatory insurance which limits the liability of the parties involved. Policies of this kind should be made complete by setting up compensation funds to handle claims that are not covered by the aforementioned mandatory insurance. In chapters V to X, authors of renown examine the impact of robots from the standpoint of criminal law, employment law and financial and tax law, as well as from the point of view of the legal profession and the healthcare system. The last chapter deals with the ethical aspects that should be present in the design, production and use of robots. As the author says, “intelligence, whether natural or artificial, is not in and of itself good or bad, yet how it is used probably is”. A technological revolution is happening in robotics that will affect virtually all human activities, for which reason there is a pressing need to draw up ethical codes that enable robots to help humanity to achieve happiness and justice, as well as to stop machines ever escaping from human control. In this regard it is worth noting that on 20 October this year the European Commission began with the first of its meetings of the group of 52 experts that was assembled to study the legal framework for artificial intelligence and robotics. These experts will start work on cataloguing the rights and obligations of robots and artificial intelligence from a legal and an ethical standpoint. In any event, we think that, from a domestic point of view, the necessary and urgent regulation of artificial intelligence and robotics calls for active and resolute cooperation between the government and the private sector. This should all be directed at lawmakers bringing new rules and regulations into the legal system as swiftly as possible. LA LEY. Wolters Kluwer España, S.A.
A technological revolution is happening in robotics that will affect virtually all human activities, for which reason there is a pressing need to draw up ethical codes that enable robots to help humanity to achieve happiness and justice, as well as to stop machines ever escaping from human control.